Hey guys…so I just came across this from one of the amazing blogs I’m subscribed to [twolaqueredgirls] and figured I would share this with my fellow followers/bloggers. 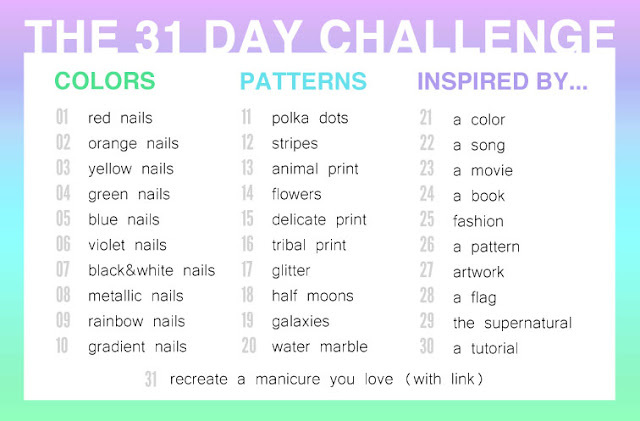 Its called the 31 Day Nail Polish Challenge, and as the name says, it is a challenge to come up with these different nail looks daily for 31 days. I will post the picture down below of the challenge. Please leave a comment letting me know if you will be joining us on this adventure, and looking forward to hearing from you guys. Please like/comment/follow if you like this post or blog and join my social network family on twitter @iluvbeautie425 and on instagram @kammie876. Have an awesome day! !